One of the most disturbing developments of the current time is the vast amount of electronic devices that are produced and fin their way to homes and businesses. Electronics have been around for many years, but in the past, these were mostly of an analogue nature. Yes, there were compatibility problems, but most problems were related to TV, radio or audio equipment that could not handle the electromagnetic (EM) fields we created with our transmitters. We could often mitigate problems with filters, screening or by adding components to block the high frequency signals. But nowadays, many switching electronics generate emissions, resulting in all sorts of noises that interfere with the signals we want to receive. Opposite to the earlier situation, where our complaining neighbours had an interest in resolving the problem, we now see owners of electronics not even aware of the fact that these devices interfere. Further, the willingness to cooperate depends largely on how well you know them, or maybe even the amount of credit they give. When we look into the legislation, many countries have directives with respect to Electro Magnetic Compatibility (EMC). In Europe, the EMC directive contains two generic articles that stipulate that equipment should be so designed that radio and telecommunications equipment can operate as intended. Also, member states should protect radiocommunications, including the amateur service, against interference. “The Electromagnetic Compatibility (EMC) Directive 2014/30/EU ensures that electrical and electronic equipment does not generate, or is not affected by, electromagnetic disturbance. One would expect a framework of limits that fulfils the above promises. But this is far from true. Next, I will discuss some findings from my own perspective. Although it may seem to be ‘just a case’, many stories from other radio amateurs confirm my findings. First of all, finding the limits as such is not at all easy. It looks as if the EU does everything to hide them from the public. A vast number of EN standards can be found and it is difficult to determine which one applies. If you want to read them to check that, you can only buy them. This is simply disgusting. Because the standards are part of the legislation, they should be accessible without charge. But with some googling, several papers are found that indicate what the limits look like. As far as I can judge, some CISPR limits can be used as a guideline. These limits apply to a measuring distance of 10 meters between the device and the measuring antenna. In my case, the distance to an interfering TV set is about 30 meters. The path loss at 30 m distance increases with about 9.5 dB, so between 30 and 230 MHz, the translated electrical field strength limit at 30 meters would be 20.5 dBμV. This is an interesting part of the story. If we assume a receiver with a good preamplifier, it should be possible to obtain a noise figure of less than 3 dB. We can therefore assume a noise temperature of about 290k. We can calculate the noise power with the formula kTB, where k is Boltzmanns Constant (1.38 E-23). T is 290k and B is assumed 3 kHz. The result is about -139 dBm. This would be true for a “quiet” antenna. Referring to a report of the International Telecommunications Union (ITU-R P.372-11, 09/2013) we can expect the noise to increase, depending on the situation. I did some measurements on 6 and 4 meters. On 4 meters (70 MHz), the ITU tables indicate that the noise will increase with roughly 10 dB in quiet areas and about 20 dB in residential areas. I decided to take the 20 dB value from Table 4 in the ITU report, with measured man made noise levels in Japan. The European values are lower, but I will take the Japanese levels, just to be on the safe side. This implies a receiver noise floor of about -139 + 20 dB = -119 dBm. When I connect the antenna, the noise increases considerably. In the quietest direction, my spectrum analyzer measures -115 dBm, so that is roughly 4 dB worse than the expected value, based on the ITU publication. If my observations and assumptions are correct, the background noise already exceeds the Japanese man made noise levels with about 4 dB. My antenna on 70 MHz has about 10.5 dBi gain. Taking feeder losses into account, the receiver noise floor should be equivalent to about -16 dBμV/m electrical field strength (with a corresponding level of -119 dBm, the “Japanese noise level”). The quietest value in my situation is 4 dB worse, so we add the above mentioned 4 dB, so -12 dBμV/m. Two sources are prominent: a TV set (Plasma TV?) and an unknown source at 70.200 (on the calling frequency, is that a coincidence?). The 70.200 source is a sort of carrier modulated with noise, spreading over 20 kHz. It is in the south-eastern direction, where the nearest neighbour is about 50 meters away. 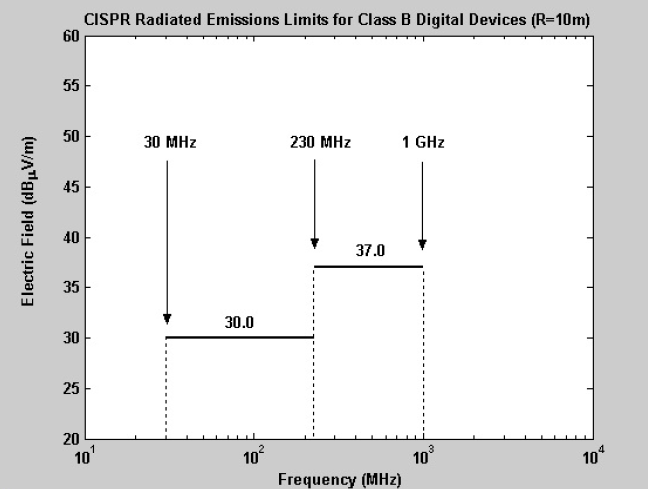 If we assume that distance, the translated CISPR limit would be about 13.5 dB lower than the value at 10 meters. The signal strength is about -91 dBm (measured in 3 kHz bandwidth), this is some 28 dB above the “Japanese” noise floor and about 24 dB above my quietest level. It has to be noted, that if the 70.200 interference field strength is translated to the CISPR levels, it would be about 27 dBμV/m at 10 m distance, so just below the limit. This demonstrates that even at greater distances, these levels cause serious degradation of the reception. The Plasma TV produces wideband interference and the received power depends on the receiver bandwidth. In 3 kHz bandwidth, I measured roughly -96 dBm, thus exceeding my receiver noise floor with about 19 dB (corresponding to about 23 dB over the Japanese noise level). In case the distance between the interfering source and the reception antenna is near the CISPR measuring distance of 10 meters, as is the case in dense residential areas, the limits result in interference levels of tens of dB over the receiver noise floor. If we translate the noted 24 dB signal to noise level to a distance where the 70.200 interference would be at the receiver noise floor, we would have to double the distance for every 6 dB, or about 16 times 50 meters = 800 meters! In quiet rural areas this would be even more, well over 2 km! The CISPR limits do not offer reasonable protection against interference and should be adjusted drastically to comply with the European directive. This conclusion is supported by various reports, that illustrate that the CISPR limits do not protect the amateur service, but only the industry. If we do not take action, there will soon be a time where amateurs, who live in residential areas, will have to pull the plug.